Todd Street Lawyer has moved! 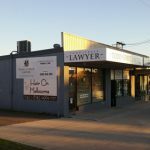 You will now find us at our new office, located at 1/30 Railway Avenue Thornton. For those of you who know the area, we are near Thornton Railway Station. If you are coming from the New England Highway, just drive over the bridge near the Railway Station. You will see us on the right hand side of the road, in the group of shops which also includes Hair on Melbourne and Thornton Veterinary Clinic. If you are heading out of Thornton, we are on the left hand side just before the Railway Station.